The 1974 Swarthmore Lecture by Wolf Mendl. Reviewed by Owen Everett. Wolf Mendl was not a typical Quaker. He certainly wasn’t a woolly-liberal; he was a pragmatist. As Reader in War Studies at King’s College, London, he possessed a knowledge of warfare and international relations and all their complexities that most Friends lack. 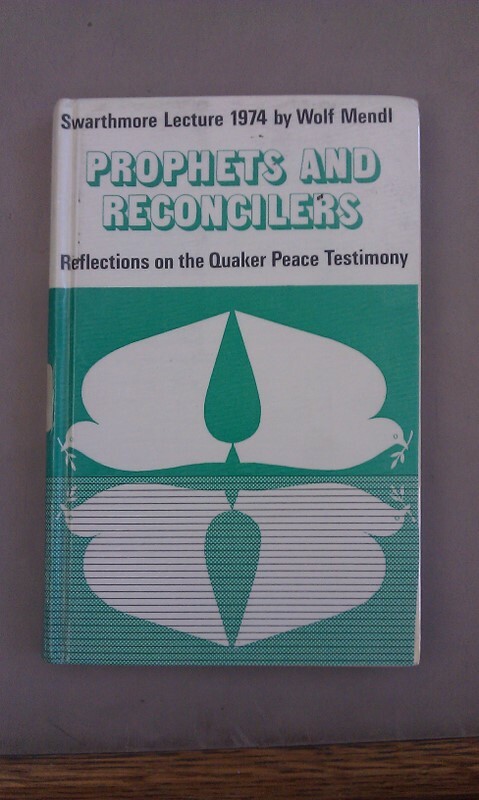 This comes across clearly in his August 1974 Swathmore Lecture ‘Prophets and Reconcilers: Reflections on the Quaker Peace Testimony’ – given at York University – and I think that’s why I found it an approachable and refreshing read. I feel a personal connection with Wolf. He was born in Berlin in 1926 but his parents relocated to my home town, Watford, when he was ten, where he lived until his death in 1999. While at school he attended Watford Meeting with his mother, exactly as I have done for as long as I can remember. He became a member of the Society in 1946 (which I have yet to do!). While I don’t recall Wolf very well I know he was an active member of the meeting and his widow, Takako, is very dear to me. 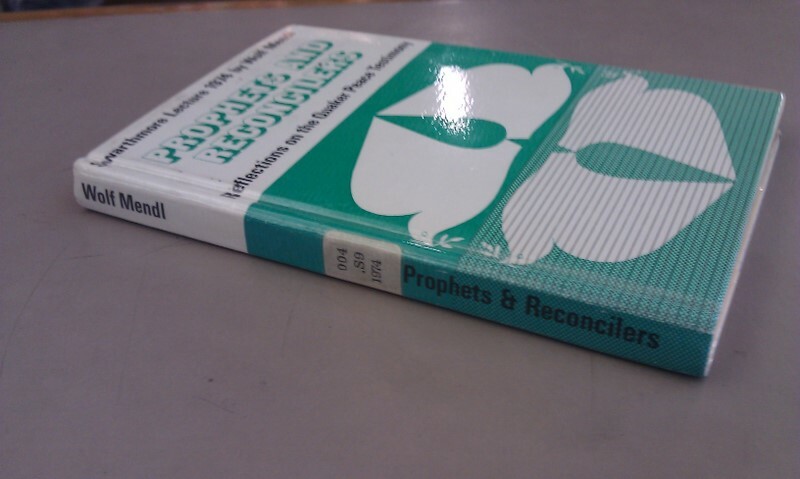 The first two parts of ‘Prophets and Reconcilers’ chart the history of what became our Peace Testimony – probably the most distinctive and well-recognised element of modern Quakerism – and the latter two assess its place in the world of 1974. In this review I explore Wolf’s main points and suggest that they are as relevant today in 2011 as they were in 1974 (hence my frequent use of the present tense to refer to both periods). By this I mean – given the diversity within the Society – that all Quakers will find relevance in what he says even if they do not personally agree. Although I find some parts of his argument inconsistent I take inspiration from the fact that whilst Wolf was predominantly a reconciler, or ‘realist’, – as seen in his dismissal of the second tenet of pacifism that it is always possible to settle international disputes peacefully – he shares a vision not dissimilar from the prophetic early Quakers in his conviction that however difficult to follow, peace is the right path, and that the power of love can guide us along it. It’s undeniable that the social, political and cultural environment in which we live shapes our outlooks and our actions. For most of us it is hard to enter the mindset of George Fox, or of a Quaker conscientious objector in the Second World War. However, despite identifying six distinct chronological phases in the historical evolution of the Peace Testimony Wolf notes that Quakers have remained true to this fundamental belief almost without exception. But what do we actually mean by ‘peace’? The most obvious definition is the absence of war and violence, which forms Wolf’s focus. He notes that the earliest Quakers of mid-seventeenth century England did not have an official Peace Testimony in capital letters, but its essence was enshrined in their fundamental aim to bear witness to the teachings of Christ, including the denial of all outward wars and the use of outward weapons as a means to respond to conflict, as later declared to king Charles II in 1661. However, Wolf rightly emphasises that peace is not merely the absence of conflict. From the outset he claims that life is a struggle to abide by ‘The Light’ inside us: tension with ourselves and others is entirely natural. His frankness speaks to me. We are not perfect nor will we ever be. Few of us would be capable of emulating Ghandian satyagrahis. I aspire to advocate nonviolence but I fear that in certain circumstances my convictions might not hold. Indeed, in his conclusion Wolf asserts that ‘Our responsibility is to participate in it [conflict] constructively and not to abolish it’: we have to struggle for peace. One of Wolf’s central arguments is that our current Peace Testimony is inextricably linked to its spiritual roots, which he seems to equate with the promptings of Christ. As a Quaker who is not a traditional Christian I always find such references slightly alienating. I know that numerous Quakers in Britain, and most in the United States and Africa (who of course comprise the world majority), do attribute inner inspiration to the Light of Christ, but today at least in Britain Quakerism has an undeniable secular current, particularly among the young generation. In fairness Wolf does acknowledge that Friends’ peace work in the twentieth century marked a move away from the religious roots, suggesting that for some ‘the witness had become secularised’. However, I would go further in saying that in my experience Quaker identity is often primarily value-based: war is seen as contrary to people’s integral principles. I disagree with Wolf and Carl Heath before him (protagonist of the inter-war Quaker ‘embassies’) that profound spiritual experience is necessary to bear witness to the Peace Testimony. Now I want to go back a step and summarise Wolf’s very interesting history of the Peace Testimony. Before the testimony became ‘institutionalised’ the Quaker witness to it consisted largely in preaching against Friends’ direct or indirect involvement in war without offering any specific ideas on how to stop war occurring. Indeed the 1661 declaration to King Charles assures abstinence from state affairs. During the so-called ‘Quietism’ of the eighteenth century Quakers largely withdrew from evils of the world and focused on meeting for worship. In short, peace was personal. Although Wolf claims that the ‘humanitarian tradition’ of working practically towards bringing change was pioneered by William Penn, a more collective approach didn’t come until 1846, when London Yearly Meeting proposed ‘“arbitration”’ as a possible role in seeking to resolve international hostilities. Shortly after, in 1854, a Quaker delegation travelled to the court of Tsar Nicholas I of Russia to try and avert the Crimean War. In 1888 London Yearly Meeting set up a permanent Peace Committee, followed by Philadelphia Yearly Meeting in 1892. The testimony to peace was becoming the Peace Testimony. However, it was only really during and following the twentieth century decades of ‘Total War’ (1914-45) that Quaker peace work developed into its form recognisable today. War economies and the use of air forces blurred the distinction between home and the front line, and the Peace Testimony was ‘seen as the most important contribution which Friends had to offer’ to the world. Numerous initiatives arose seeking to address the causes of war, such as the creation of Quaker ‘embassies’ in Paris, Berlin, Warsaw and Geneva in the inter-war period, and facilitating conferences for young diplomats and international student seminars in the 1960s. Yet returning to his contemporary world Wolf claims that there was, at least among his Western European contemporaries, a ‘general disbelief in the danger of war’. This is somewhat surprising, even given that Cold War tensions in 1974 were certainly much reduced compared to the years leading up to the 1962 Cuban Missiles Crisis. Yet from a home perspective I think there is significant similarity between then and now: war does feel like something that happens elsewhere. Wolf criticises what he considers an overemphasis on disarmament, the mistaking of a symptom for the cause, which he views in any case as unlikely to succeed on any significant level. This view is a little deflating for enthusiastic Quakers who have been keenly involved in campaigning for disarmament, but again his expertise in the field adds authority to his view, and his support for Quaker peace work is never in doubt. The three main areas of that work that he identifies seem very much those familiar today: the development of institutions in the hope of creating a world system based on non-violent conflict resolution, the application of non-violent techniques to existing conflict situations, and the study of the causes of war and violence to better inform us how to try and avoid them. Wolf stresses the Society’s ‘corporate responsibility’ to offer a spiritual home to active individual members, who often work far outside of the small Quaker world in their struggle for peace. This support remains crucial today, with Quakers working towards peace both as volunteers in conflict zones and through positions relating to Quaker Peace and Social Witness. For me one of most striking parts of the lecture is Wolf’s assertion that ‘one can also point to a very different type of soldier who has a tender conscience’. I immediately thought of a recent article in The Independent on the singer and former British army officer James Blunt. He headed a NATO ‘peace-keeping force’ in Kosovo in 1999, and was ready to disobey an order to “destroy” Russian troops guarding a strategic airfield: just the sort of conscientious soldier Wolf alludes to. James Blunt was clearly deeply affected by his service: “For me, if anyone wants to be labelled pro-war, they would be obscene… War is an absolutely terrible, ghastly thing.” Although I doubt that many pacifists actually hold the narrow-minded image of military personnel as ‘brutal, depraved and unprincipled’ which Wolf accuses them of, it is important and humbling to recognise that even the apparent protagonists of war dream of peace. Wolf notes that a significant number of the earliest Quakers were veterans of the English Civil War, speculating that this direct experience of the horror of war (which some Friends will undoubtedly be able to empathise with) may well have been a factor in their renunciation of outward weapons. All this makes Wolf’s claim that ‘The word peace itself has become an empty political slogan under the cover of which everyone goes to war’ seem uncharacteristically despairing. Wolf concludes that modern Friends with our separate testimonies lack some of the central vision of the founding Quakers. He reasons that we have to strike a balance between working for change and standing back, as we can’t make meaningful statements on every major issue and we need to keep a sense of our basic message. Yet considering his points on the centrality of the Spirit and ‘corporate responsibility’ I find myself asking: surely the basic message should come from inner promptings and therefore cannot be restricted? The difficulties of adhering to the Peace Testimony are evident. Quakers during the ‘Revolutionary Era’ (circa 1776-1815), in buying their way out of militia service, were effectively paying for a substitute and thus still contributing to the war effort indirectly. Wolf doubted whether Friends in 1974, their children or their grandchildren were likely to transform the world regardless of their spiritual convictions. However, despite never losing touch with his sense of reason and caution, among his final lines is a timeless piece of advice: that we avoid a sense of hopelessness and futility in the struggle for peace by ‘living our lives in the power of love and not worrying too much about the results. In doing this, the means become part of the end’. 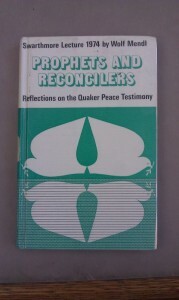 Prophets and Reconcilers by Wolf Mendl is available to be borrowed from Quaker Meeting house libraries around the UK. 2011/03/25 in Projects, Swarthmore Lectures. Thank you. Wolf was indeed a true prophet and reconciler. An interesting piece Owen. Thank you for waking me up to issues that I had not thought about for some time. I remember Wolf with great fondness. Perhaps if we had our pacifism tested as say Rwandan Friends did we would be driven to find a strong spiritual basis for our position. Thank you for the article, Owen, which reminded me that I must re-read the lecture. I am particularly interested in why the restored Charles agreed to see Margaret Fell in 1660. Have you come across anything about that? A pity you do not remember, Wolf. You would have liked his sense of humour. His spoken ministry often caused us to giggle as he made some very telling point. Thanks for all of your comments. I was recently alerted to them by Eric; apologies for the belated response! 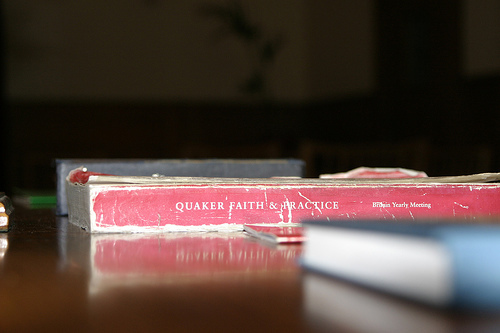 Since writing the review I have become more open to the Christian roots of Quakerism and in my own beliefs (due in part, I think, to my experience of Yearly Meeting Gathering). @Terry: Perhaps indeed. I think it’s difficult to know your faith until it is truly put to the test. @Eric: It is very interesting, I’m afraid I don’t know anything more on how she and other deputations went about being seen. By the way you did make me and my dad laugh with the Wolf anecdotes you told us at meeting a few weeks ago! It is an interesting topic as to how Margaret Fell managed to have audience with Charles II and his brothers. Certainly she, and George Fox, frequently gave money to people in high places – [see Isabel Ross, “Margaret Fell: mother of Quakerism” (London: 1949) pages 303-4] and this may be a factor. Both George Fox and Margaret Fell had acquaintance with many members of the royal family, such as Princess Elizabeth, granddaughter of James I, and Prince Rupert who supported Margaret when she appeared before Charles II. When Margaret made her first visit to London to plead for George Fox, she stayed at the very large Pall Mall home of Elizabeth Trott. Although gentlefolk could easily approach the king and give him letters, it is possible that Elizabeth Trott, wife of John Trott Esq. effected an introduction.